Today I’m being featured as a guest poster over at i Dream of Clean – hosted by Christine, a bloggy friend who lives in Nashville. I wrote about how to make your very own green cleaning products. Exciting stuff that I am very passionate about! 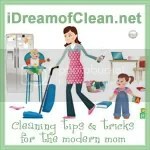 Be sure to check me out here: i Dream of Clean – Cleaners You Can Make at Home. Or, if this is your first time to my site: WELCOME! Feel free to browse around and enjoy. How is cloth going… really… I mean, how’s it going? 4 Responses to "I may not live in Nashville any more, but I still have connections"
I loved how simple it is to make your own cleaners. I am totally going to start doing this. Every time I spray down my kitchen with cleaner, I think about the little girls that will be eating off of and touching the counters and table. I also live in Nashville and I love Christine! I always felt the same way before I made the switch. And the bonus? A huge container of vinegar is like $2 – and I seriously hardly ever buy one they last so long! Love this, way cheaper than buying green cleaners like Mrs. Meyers! I’m going to start next time we run out. Thank you SO much for guest posting and sharing your knowledge!